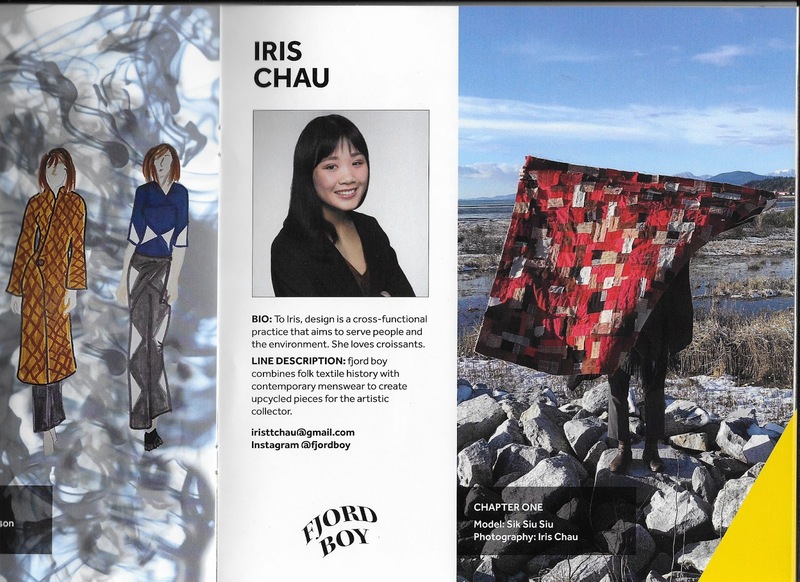 Today's interview is with Iris Chau of Fjord Boy. 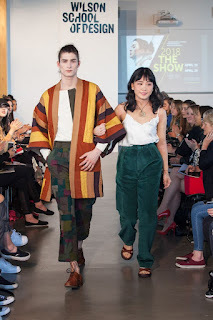 What drew me to her collection was that she created all her fabrics by upcycling discarded remnants sourced from Our Social Fabric, a Vancouver textile recycling initiative. What a labour intensive undertaking. Where were you born, where did you grow up? What you like when you were young? I was born in Montreal, Quebec, and grew up in Vancouver, B.C. I loved several things as a child, but everything that I loved had to do with the arts. I loved painting and drawing but also writing stories and poetry. My main interests in high school were music and fashion. It was in my teenage years that I developed my own taste for music, especially as a way to connect to my Chinese heritage. I was obsessed with consuming Chinese and Taiwanese media in order to familiarize myself with that type of pop culture. In turn, a lot of my taste in clothing would be influenced by what was trending in Asia, because I observed the culture so closely. At the same time, I was taking home economics classes each semester and developing my skills in sewing. I remember going to school early in the morning and staying at school late just to work on my sewing projects. Looking back now, I believe I was so driven in my textiles classes because I truly wanted to create clothing that I could wear and stand out in. I guess it can be said that my interests were really about finding my personal and cultural identity. Growing up, I never got an allowance from my parents, not even in my teenage years. I had nothing to spend, and therefore I couldn’t buy new clothes for myself. I was always afraid to ask my parents to buy me clothes because I knew that money was tight in our family—often, I just waited for them to suggest going shopping. I remember one time where I really wanted to wear something different. I was so tired of my own clothes, I raided my sister’s closet for the first time and tried on her clothes even though she was much older and a different size. Sometimes, I would even wear pyjama pants and roll them all the way up to the thigh to make them shorts! I always had to exercise creativity when it came to wearing something new and fresh. I had such a yearning to express myself through dress—for a long time it was all I cared about. Talk about when and how you decided to study fashion design, Was you family supportive? 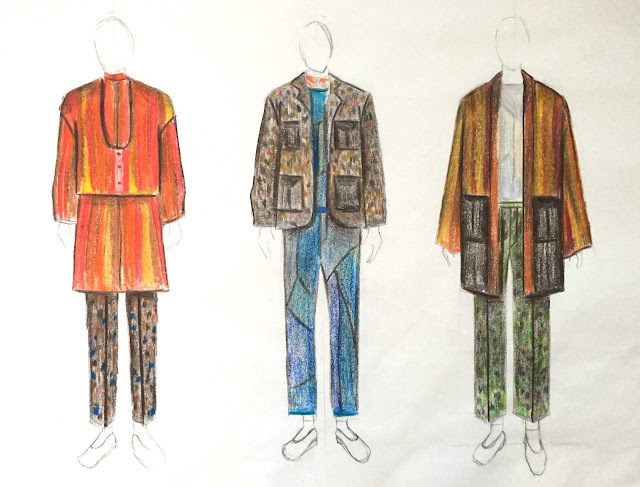 I decided to study fashion design when I was in tenth grade. I had always been interested in the idea of being a fashion designer, but I only truly decided to pursue it when I was fifteen. In high school, I dealt with a lot of insecurity issues about my body and my style. In order to combat these insecurities I relied on clothing and the ability to make clothing. Knowing how to sew was extremely empowering. It gave me confidence. I hoped that if I was a fashion designer, my designs could help somebody else like me feel confident as well. My family was supportive, or, more accurately, they were indifferent. I am the youngest of three, and my parents like to joke that by the time I was born, they gave up on enforcing expectations and rules for me. They were very strict in bringing up my brother (he is a doctor), moderately strict in bringing up my sister, and when it came to my turn they adopted a very flexible attitude. 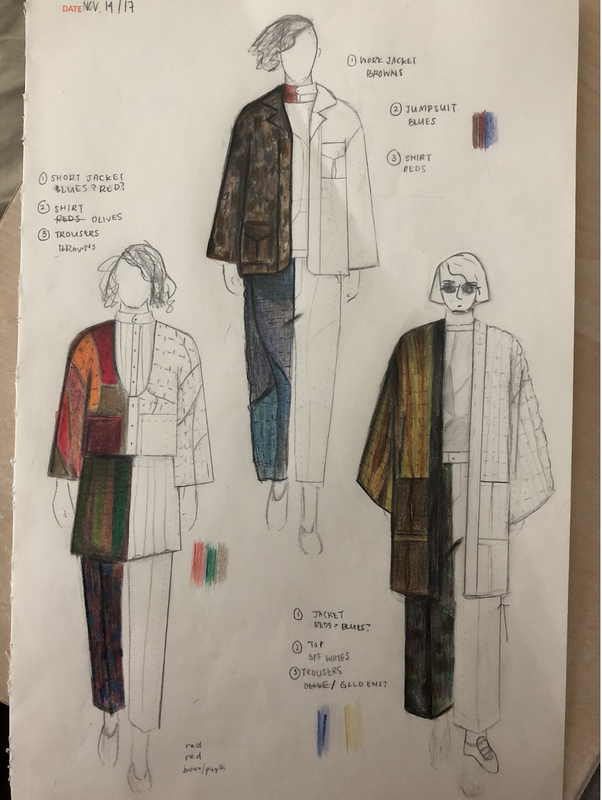 My high school textiles teacher graduated from the Fashion Design & Technology Program and was very enthusiastic in promoting it to budding fashion designers. She was the first person to introduce the idea of fashion as a career to me, whereas before I always thought of it as a hobby or a fluffy dream. She convinced me (and other classmates) that fashion is not just about glamour and brand names. Instead, it can be very practical, and have a plethora of job options. For example, studying fashion is not just about being a fashion designer. Studying fashion could land jobs such as product developer, sourcing manager, raw materials liaison, colorist…KPU would be the right place to train for that. It was easy just getting through every day of school because of my peers. So much of studying fashion design at KPU is about the community. Truly, what makes the program so special amongst other fashion programs is the comradery within these walls. Everyone is incredibly supportive of one another, and we constantly marvel at each others various talents. We all recognize that we have different strengths and weaknesses and we celebrate that. Without this, I am sure fashion school would be an emotional, mental nightmare. It’s the technical, skill-related stuff that was difficult. For example, I struggled quite a bit when I was exploring how to make a hiking and snowboarding jacket. What’s more, I struggled with not letting those struggles bring me down. Every time I can so evidently see my own flaws through my sewing, I am hard on myself. I always have to go back and remember that everyone has different strengths and weaknesses. Sewing, even though I did it in high school, was one of my weaknesses that often took me much longer than my peers to complete. Not letting that get to me was difficult. The inspiration came from an exhibition I saw in the summer of 2017 on African American art. 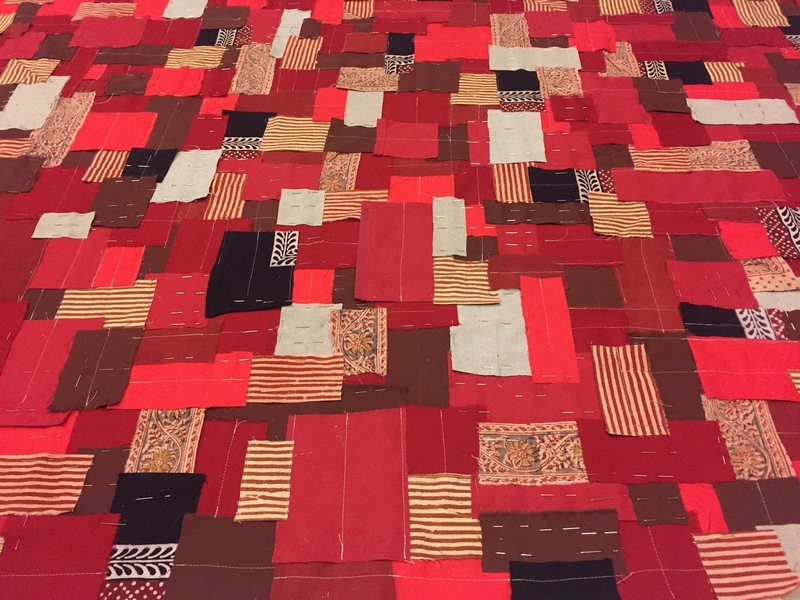 It was at the de Young Museum in San Francisco and it featured quilts from Gee’s Bend, a small rural community in Alabama. I was fascinated by the techniques the people there used to make the quilts—they were truly one of a kind. Everything from the colors, to the shapes, to the organized chaos in their work moved me on an emotional level—especially considering that they used mostly scraps and leftover materials. I was so inspired by the idea of these utilitarian practices, such as quilting, could end up into such marvelous pieces of artwork. From there, I decided that I really wanted to honor these traditional ways of treating cloth. This includes quilting, patchwork, and fabric mending. I also wanted to help alleviate the issue of textile waste that is so prominent in our industry. This led me to use only upcycled or reclaimed textiles in all of my work, which blends well with the whole idea of using older techniques, creating a time-worn aesthetic. 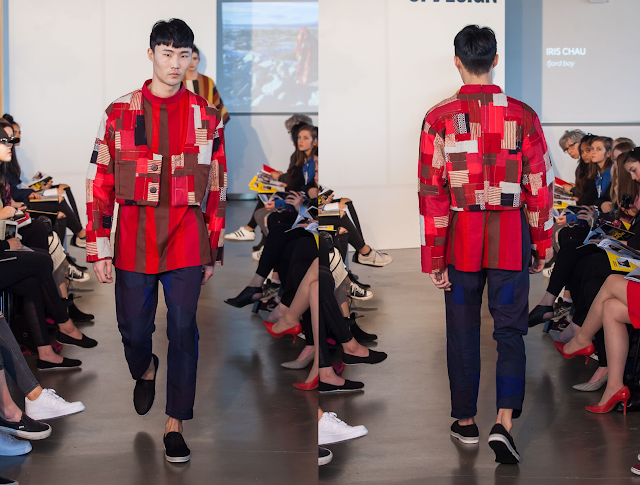 My collection is an upcycled menswear collection for men who love fabric, texture, richness in colour and craft. I find that many sustainable brands tend to cater to women first—and same with brands that work with traditional craft or fabric techniques. I wanted to open up this product option for men. I like to think that this is the male version of the woman who loves Granville Island and buys all her clothes from Maiwa. Japanese Boro – Boro is the Japanese art of patchwork. . Patchwork is where I have a muslin base, and I cut patches that sew individually onto that base. Boro comes from the early 1900s rural Japan, where people would simply patch their clothing whenever there was a rip. Because they continued to patch for years, the original garment became this beautiful mosaic of patches. Vintage boro is now very coveted in Japanese street wear and is a collectible. Blockwork - Blockwork is where there is no base. 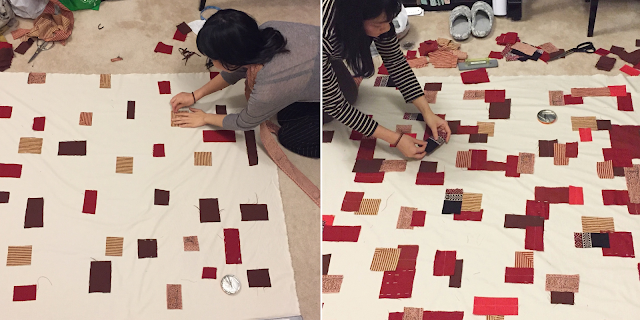 Instead, I cut pieces of fabric that sew directly to each other instead of onto a base. Mushroom – Mushroom is like blockwork, except I only cut or use pieces that are long. Long strips of fabric sewn together resemble, to me, the underside of a mushroom—which explains the name. When I go about choosing which fabrics to use, I usually choose fabrics that are easy to sew to other fabrics. Fabric mixing can be complicated—so I specifically choose fabrics that would be easily mixable in order to attain a harmonious drape and look. Usually, this means choosing cottons or linens. The palette really depends on what materials are available to me. In other words, the fabrics determine the palette. Now, not all brands work this way. A lot of the times, designers will choose the colours before they consider the fabrication. However, more and more brands are becoming seasonless, and with that, there is more room to be flexible. 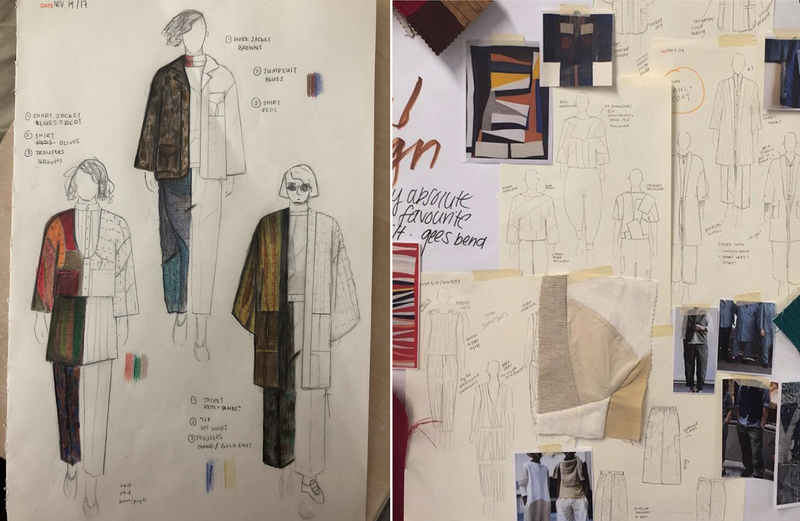 As a seasonless collection, I am able to design outside of a traditional five-colour palette and be able to use what I find in leftover or reclaimed fabrics. 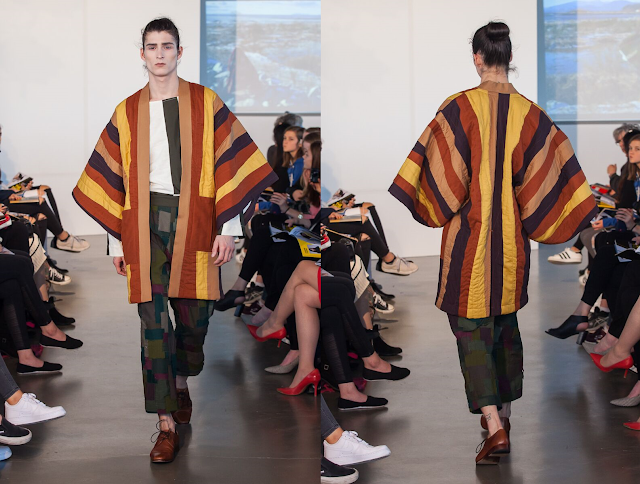 To ensure the collection is still cohesive without a definitive palette, I chose to stick with warm tones and would use the same fabrics in my patchwork or blockwork throughout the styles where I could. Actually, no! I like all of my looks equally. However, I especially do like taking traditional silhouettes and adding a new dimension to them. For example, my haori jacket is such a classic shape, but because I quilted it, it now has this stability and air of something unmistakably contemporary. Honestly, I don’t think I can bring anything new to the fashion world. I can reinterpret the old, but I can’t bring anything truly, truly original and new to fashion. I am okay with this. The fashion industry is highly saturated and being new is no longer the same or as important as being relevant. What the fashion industry needs right now are more warriors for sustainability and ethical fashion. I like to think that I can be a warrior and join the many others who are currently fighting for these values. I will be doing a little travelling this summer, to Mainland China, in fact! My dad has never been to the Great Wall of China, so my sister and I are planning to take him as it is one of his life’s dreams to see it. It will be my third time in China and my sister’s first. “The whole idea handed down to me by God is to use that which has been discarded, just as we as a people have been discarded, made invisible. That what is invisible, thrown away, could be made into something so it demonstrates that even what gets thrown away, with a spirit in it can survive and grow.” Joe Minter, ‘outsider’ artist from Birmingham, Alabama, b. 1943.